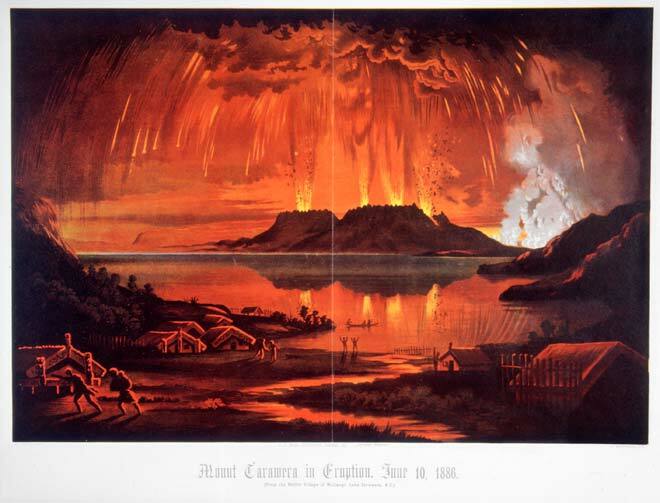 This lithograph of Mt Tarawera erupting on the night of 10 June 1886 was made by A. D. Willis, based on a painting by Charles Blomfield. The view is from the Māori village of Waitangi, on the northern shores of Lake Tarawera, where there was only a single death. Blomfield did not see the eruption, and reconstructed the dramatic scene from what he had been told. In Te Wairoa, a few kilometres closer to the volcano, Charles Haszard observed the eruption from his verandah and had exclaimed, ‘What a grand sight! Should we live a hundred years we shall never again see its equal.’ He died a few hours later when his house collapsed. charles haszard, now thats true irony! The day before the Tarawera eruption of 10th June 1886, one of my great aunts was visiting one of her sisters at their house in the Bay of Plenty. When it came time to leave that afternoon, they were already up in their wagon when the sister who was staying said, 'look at that black sky up ahead, where you're going--you'll be on the road, and get soaked. Stay another night and leave in the morning.' So they stayed, and early next morning Tarawera went off with a bang that woke them all up, and kept them awake for hours. The house got so much ash on the roof that it started to sag, so the linked arms and made their way across the the hen-house, and stayed there for the duration of the event.